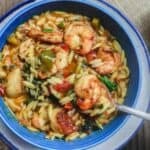 Although I just shared a list of 11 One-Pot Mediterranean Recipes, I could not help but add a new favorite here: Mediterranean Shrimp Orzo Soup. Step-by-step tutorial below the recipe. 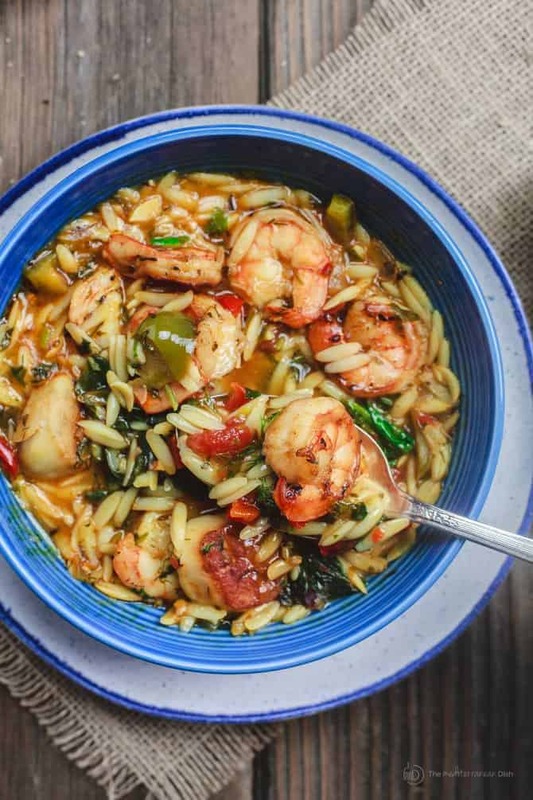 The best way to describe this simple shrimp orzo soup is this: warming, but not coma-inducing. 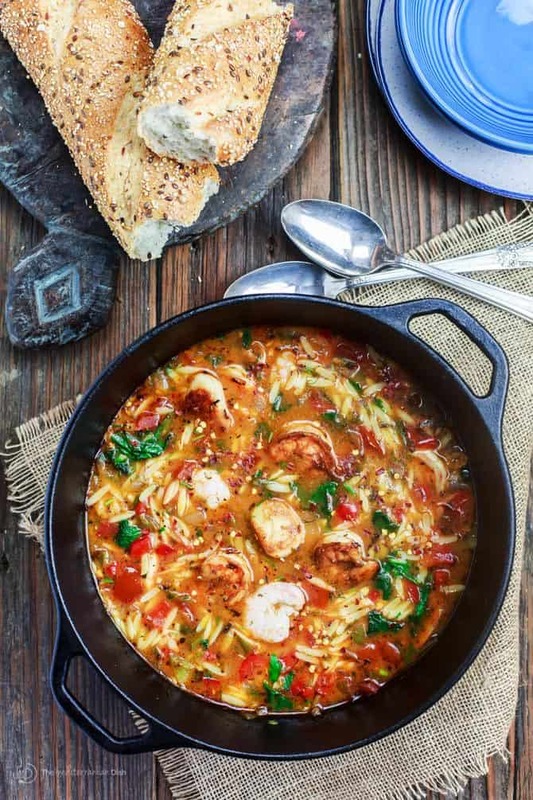 This orzo soup is one you can certainly make on cooler fall days or in the deep of winter. But if you choose to make it on warmer days, you will regret absolutely nothing! In my opinion, this is a soup for all seasons. 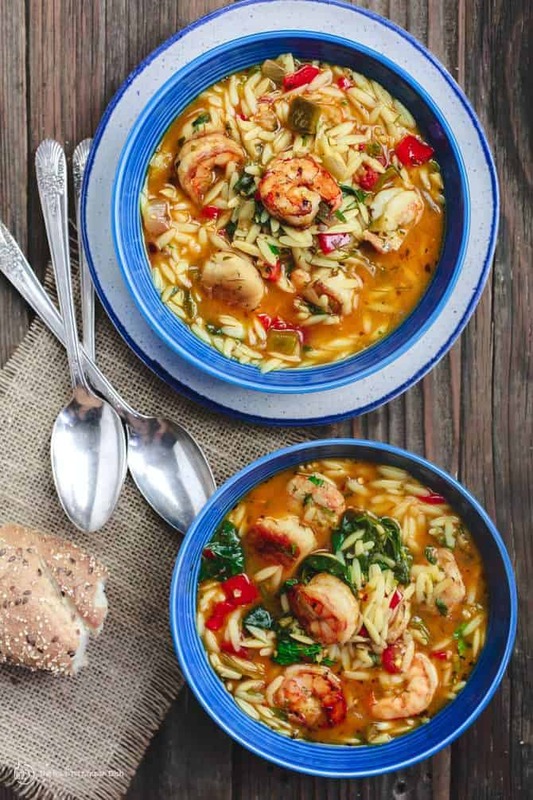 The choice of whole grain orzo pasta lends this soup more fiber and enough body, but keeps the fat content lower. 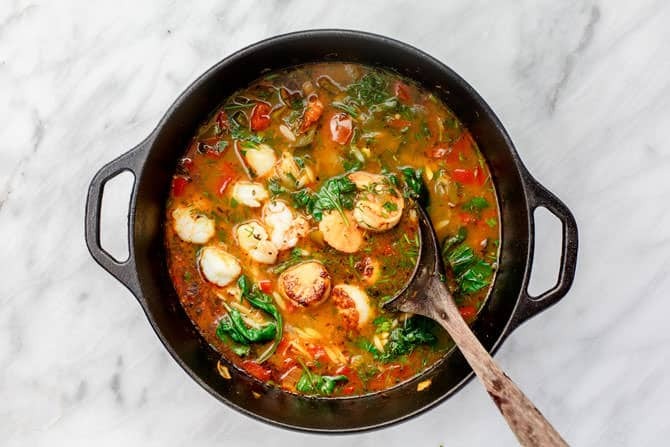 Seared shrimp and scallops add leaner protein, but also lend a bit of a not-your-average-soup feel! I typically only use shrimp, but since I had a small sample of sea scallops, I threw them in. Feel free to adapt the recipe to what seafood you have on hand! No surprise to you, I begin the flavoring process by sauteing garlic and onion along with my bell peppers. 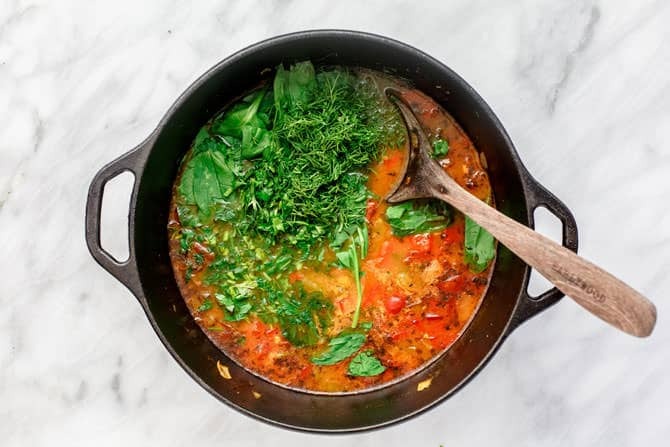 But the addition of fresh parsley, dill–which I think is the forgotten herb– and lemon juice, add a uniquely Mediterranean finish to this orzo soup. No, you may not skip this part, it wakes everything up! 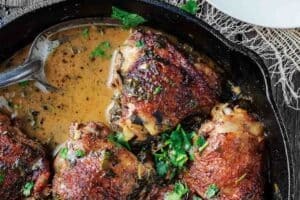 Another One-Pot Mediterranean Recipe favorite of mine! This dish is bursting with flavor. You are sure to love it! Pat the scallops dry and season with salt and pepper. 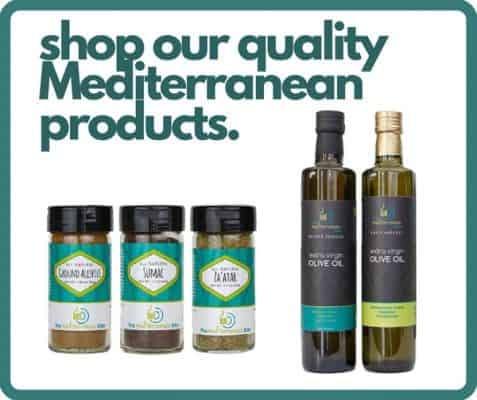 In a cast iron skillet, heat 1 tbsp olive oil on medium-high heat. When the oil is hot, gently add the sea scallops. Sear for about 1 1/2 minutes on each side. Scallops should form a golden brown crust. Sprinkle a large pinch of dried oregano. Transfer to a dish and set aside for now. 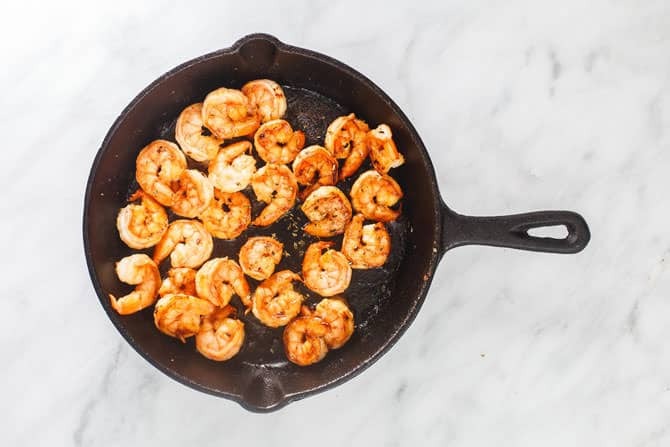 To the same cast iron skillet, add a little more oil if needed. Once oil is heated, add the shrimp. Sear on both sides until pink. Remove from the heat. Sprinkle a generous pinch of dried oregano. In a medium heavy cooking pot, heat 1 tbsp olive oil on medium-high. Add the chopped peppers, onions, garlic, tomato paste, salt and the remaining dried oregano. Cook for 5 minutes, stirring occasionally. Add the vegetable broth and bring to a boil. Add the diced tomatoes. Cook on medium-high for 3-5 more minutes. When the liquid returns to a boil, add the orzo pasta. Turn heat down to medium and cook for 8 minutes until the orzo is tender. Stir in the baby spinach, parsley, dill, and lemon juice. Finally, add in the cooked scallops and shrimp. Cook very briefly until everything is warmed through. Taste and adjust seasoning to your liking. Add crushed red pepper flakes for some heat, if you like. Serve with your favorite crusty bread. Clean and pat the scallops so they’re nice and dry. Heat 1 tbsp olive oil on medium-high heat in a cast iron skillet. Add the sea scallops. Sear the scallops on each side for about 1 1/2 minutes until a nice golden brown crust forms. Finish with a pinch of dried oregano, and transfer the scallops to a different dish until later. Do the same with the shrimp. 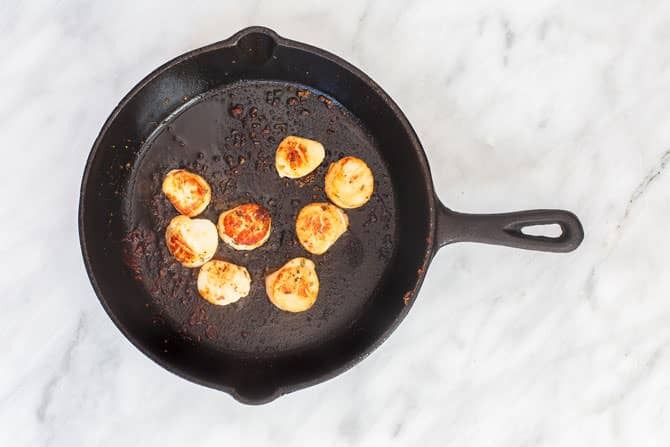 Add more oil in you trusted cast iron skillet. When the oil is hot, throw in the shrimp. Cook on both sides until nice and pink. Remove from heat and finish with a generous pinch of dried oregano. Set aside for now. Begin to make the orzo soup. In a heavy cooking pot (this is the one I use), heat 1 tbsp olive oil on medium-high. 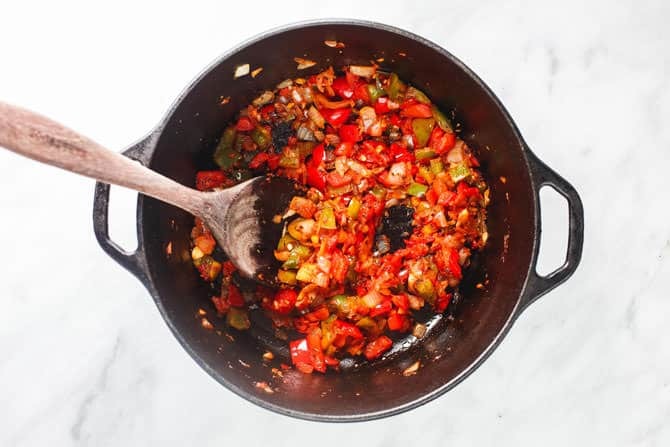 Throw in the chopped peppers, onions, garlic, tomato paste, salt and the rest of the dried oregano. Cook for 5 minutes, and stir to avoid anything sticking to the cooking pot. Pour in the vegetable broth and bring it to a boil. Once the liquid is boiling, add the tomatoes (or diced canned tomato if you like). Cook on medium-high for a few minutes, about 3-5 minutes or so. You’ll want the liquid to return to a boil, then add the orzo pasta. 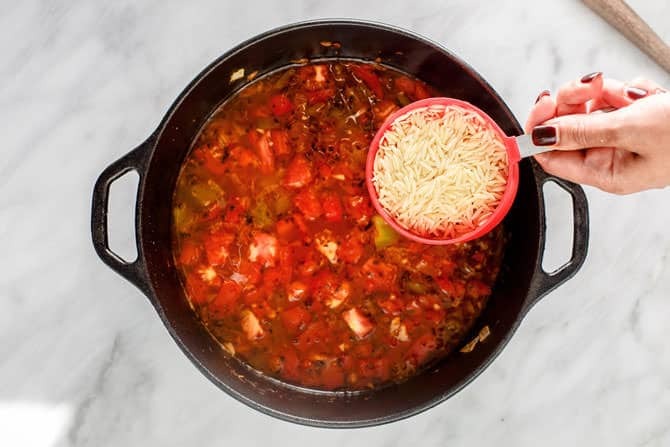 Turn the heat down to medium (or medium-low, if your stove is too powerful) and cook for another 8 minutes until the orzo pasta is nice and tender. Now it’s time to stir in the baby spinach and the delicate parsley and dill. Add the lemon juice as well. Give everything a good stir to combine. Now stir in the cooked scallops and shrimp. Cook until all is nicely warmed through. Taste and adjust seasoning to your liking; add more salt or dried oregano if you like. I also like to add a pinch of crushed red pepper for some heat. Serve hot with your favorite crusty bread! Love this recipe. So fresh tasting, The amount of herbs you suggest are perfect. Any thoughts on making this vegetarian? Made exactly as written. My husband and I both enjoyed the soup. It was delicious!! Plenty leftover for tomorrow. I will definitely be making this again soon. This soup is yummy!! I will definitely be making this again very soon! Hi! If you use canned diced tomatoes what size can should you use? 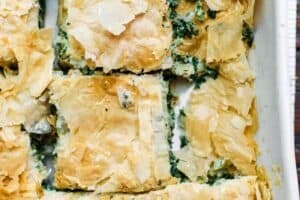 I made this recipe last night and my entire family raved! I love how light and simple it is, yet extremely filling. Although I love sea scallops, I had a ton of shrimp on hand and used that alone. I also used ditalini, instead of orzo, again because it was what I had on hand. 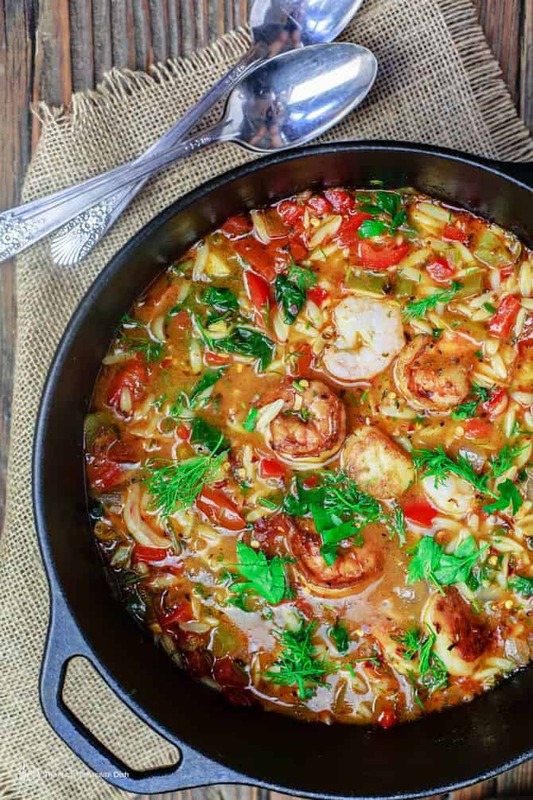 I can’t wait to try it with sea scallops and orzo next time around! Thank you, Moranda! So happy to hear it!!! So im gathering you never made this dish and yet are rating it a one star? I find that very unfair, as this is a recipe ….based on taste. If you don’t want to make the dish based upon your preferences, thats fine, but to rate a food recipe without making it or tasting it is wrong. I assume the sodium is coming mostly from the vegetable broth. It could easily be made with unsalted vegetable stock with a reasonable amount of salt added to the cook’s liking. This is what I will do as we need to keep the sodium in our diets down. Because we don’t use much salt in cooking or at the table, we don’t find low sodium recipes lacking in flavor and would likely find this salty. However, it doesn’t detract from the quality of the recipe you have printed. Different strokes for different folks. Looking forward to trying it. 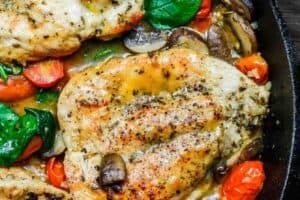 I made this recipe tonight and we loved it! I wasn’t sure about the dill but it worked so nicely. I had about half of the amount of spinach and I had some kale so I used that as well and it was delicious! That’s awesome, Debbie! Glad you enjoyed it! I am a new convert to your site and love that all the recipes are so well-planned and explained. I can’t tell how many servings this soup will make. Can you include that in your recipes as well! There are just 2 of us and I would make this as a dinner soup to serve with salad. Prob’ly leftovers for my sweetie’s lunch next day. Also, is your site geared to mobile devices. I keep my iPad in the kitchen with recipes up on it and I can’t seem to get yours to load in a timely fashion, if at all. I checked my internet speed and it was super fast. Thanks! Keep sharing these super good and healthy (mostly) recipes. Hi Cori, glad to have you here! This soup generously serves 4 for dinner, so you’ll have some leftovers for the next day. If you need to cut the ingredient list down a bit, it’s fairly forgiving. Thanks for your note regarding the mobile version; I can have that checked out although it loads fine on my mobile devices. But I do appreciate you sharing your experience and will have our web developer take a look. Happy cooking! Hi Suzy, made his soup last night and it was delicious with just shrimp! I had leftover zucchini and corn and added that as well. Will be making again. Awesome, Maria! So glad you enjoyed it!!! do you measure parsley and dill before and after chopping? recipe is written as if you measure after chopping (i think), but it seems like an awful lot that way. please clarify. if you measure before chopping, do you pack it in? My honey doesn’t like shrimp (what is wrong with him??). Can you recommend another alternative? Lol! I assume he would feel the same about lobster? 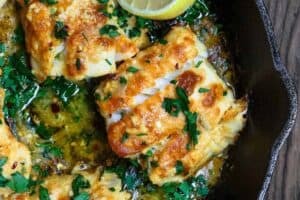 If he likes fish, you can cube a white fish like cod into small pieces and use instead. This looks amazing. Your recipes are so good. I lived in Saudi Arabia for quite a few years and really crave this type of food. Only caveat. I wish you had the nutritional information on your recipes. Thank you so much, Susan. I’m glad you’re enjoying the recipes. I am looking into adding a little program to help with the nutritional information…I hope that will be available soon, but I really don’t know exactly when. There are great sites/apps like my fitness pal and the like that can be helpful to you. This was fabulous..l.thank you so much…I substituted the orzo for bulgur wheat it turned out great…just trying to cut back on calories….thanks again. So glad to hear it, Cyndikay! I enjoy bulgur as well…I’ll have to try it in this recipe! For information on calories etc, there are some wonderful apps out there that can provide a more accurate count. I think My Fitness Pal is one of them, but I haven’t used it in a long time. This looks just fabulous! I’m definitely going to be making this one! Oh it is a favorite, Peggy! Thanks for checking it out! Hi, Clare. You should be able to serve up to 6 people. I just made this tonight, and it’s simply delicious! I was worried about adding so much fresh dill to the soup — but it complemented the shrimp and scallops perfectly. 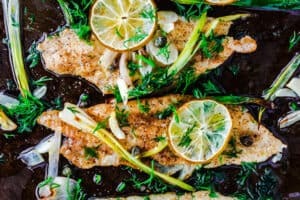 I’m new to this blog — can’t wait to try another recipe!